Tello guarantees the TRACEABILITY of all products marked with this symbol, from the raw material source through to the end consumer. The IFS (International Food Standard) certificate is an international quality standard designed to guarantee the legality, safety and quality of the products produced by the company. 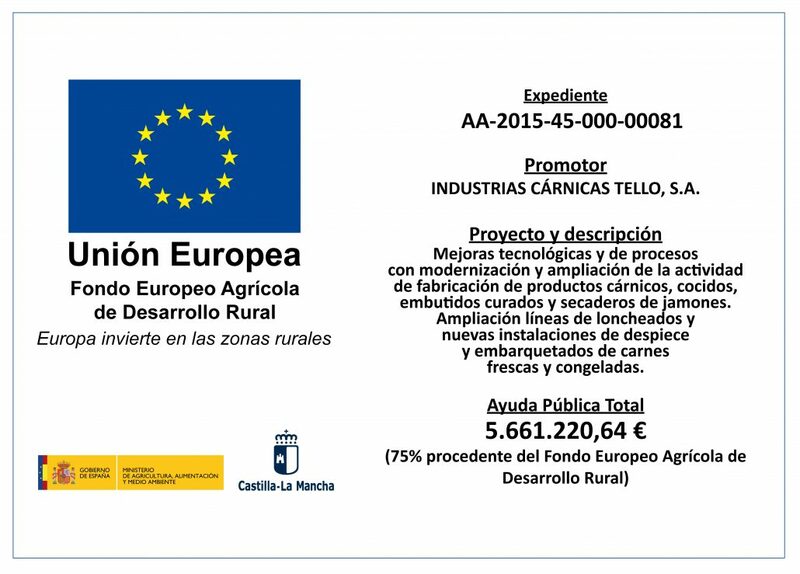 The IBÉRICO PRODUCT CERTIFICATE guarantees that the Tello “Vetas de Oro” Ibérico products meet the requirements of the QUALITY STANDARD FOR IBÉRICO PORK, HAM, PORK SHOULDER AND CURED PORK LOIN (RD 4/2014, 10 de enero). The CURED SERRANO HAM TSG CERTIFICATE guarantees that the cured Serrano ham produced by Tello meets the required specifications of “CURED SERRANO HAM” TRADITIONAL SPECIALITY GUARANTEED (Commission Regulation (EC) no. 2419/1999 of 12 November 1999).